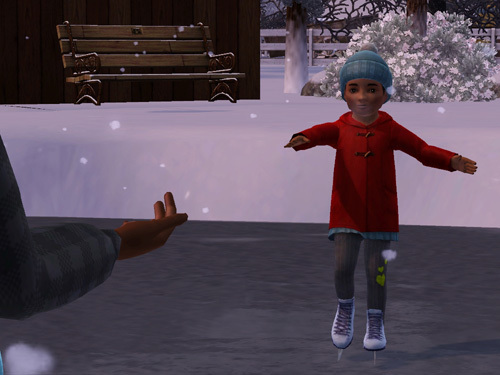 This entry was posted in Photo Friday and tagged game: Sims 3, photo: family, photo: model:female:toddler, photo: model:female:young adult, season: winter, setting: Appaloosa Plains. Bookmark the permalink. I didn’t know toddlers could skste! That’s so cute ! Toddlers in Sims 3 can’t by default. That’s why I had to use custom content for the skates themselves, and a pose, both of which are linked in the CC Highlights. It was actually more difficult to setup than I thought, since in Buy/Build Mode the frozen pond immediately switched to the unfrozen state and my actors sunk like a rock, requiring a lot of extra OMSP shenanigans I wasn’t expecting!